Paper has a painstaking memory. Any crease, kink, ink, or pinch alters a sheet forever. Like aged skin, paper cannot be unwrinkled. In the hands of Jimmy Robert, paper is pressed to take on nearly human traits. Over 40 artworks on, of, or like paper comprise Vis-à-vis, Robert’s large and ethereal solo exhibition at the Museum of Contemporary Art in Chicago (on view through November 25). His artwork conceives of the human body as a delicate layering of sensations and experiences, which he documents using paper and paper sculpture, performance, altered found photographs and ones newly made. Welcoming visitors to the exhibition is a portrait gallery of repressed images—a digital print collection of faces shrouded and marred by the artist. 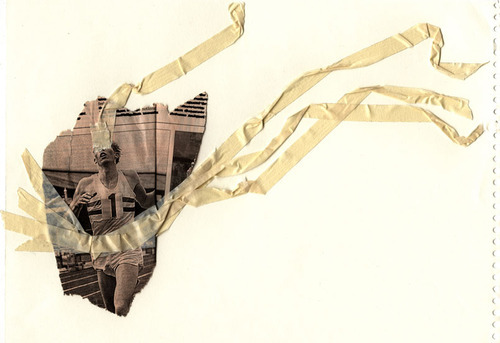 Eye-catching among them is Untitled (feel nothing), 2006, an eerie photo-collage print of a male marathoner caught up in masking tape. The interpretive layers are manifold: the tape illusionistically flutters off the sprinter’s torso at the finish line, recovering an old loss; the shoddy masking tape fixes the memory in a scrapbook of regrets; the skin-tone tape approximates a hemorrhaging of spirit. The marathoner’s newspaper caption reads “feel nothing,” a phrase quietly crying out among a redactor’s black pen. But, to “feel nothing,” to stoke numbness, is a paradox. One cannot sever emotions as easily as a limb. Robert’s artworks register, in real time, changes in emotional temperature. Large, wall-bound prints with bottom edges unpinned, and other exposed papers draped over tables, wave softly in the wake of passersby, responding like barometers of human presence. In roughly eight years (all works 2004–2012), Robert has improved the timeworn symbolism of paper as journal, as history, as the past. An astrophysicist might poke her finger through a folded sheet of paper to illustrate the possibility of time travel, a shortcut through space-time. So too does Robert’s improvisational origami describe a path to a multiform self. Abstractions blossom when tickled.